DM&IR had both SD38s and SD38-2s. The SD38s, including No. 223, came from the EJ&E. Representatives of both types sit in a salvage yard awaiting a future owner in 2011. ©2014 Ryan C Kunkle, licensed to About.com, Inc.
What began as a true "Special Duty" line of 6 axle locomotives has evolved into the standard power for nearly all of today's locomotive needs. EMD's SD series includes the best selling locomotive models of all time. From the mainline to museum collections and everything in between, the SD series remains a popular locomotive choice on railroads of all sizes, including model railroads. The SD35 is easily distinguished by its small stature. With a hood much like the more common SD40, the SD35 uses the same frame as the SD7 - providing a smaller space for the fuel tank and very short end platforms. Used in heavy haul work from iron ranges to hump yards, the SD38 was sold in low numbers but offered decades of reliable work. Union Pacific didn't purchase any SD38-2s, but through its mergers with Chicago and North Western and Southern Pacific, it acquired the largest roster of the type. Here a pair work one of the humps at North Platte. ©2014 Ryan C Kunkle, licensed to About.com, Inc.
With an updated electronics package, the SD38-2 offered similar performance and sales as the SD38. Even more rare than the SD38, the SD39 and SD39-2 offered a mid-sized locomotive option that few railroads found necessary. This Athearn HO model represents a former Central RR of New Jersey locomotive. ©2012 Ryan C Kunkle, licensed to About.com, Inc. The SD40 was introduced as a mid range option which was overshadowed in early years by the larger SD45. Its reliability and efficiency quickly impressed buyers however and the SD40 would go on to be one of the most popular and long-lived EMD locomotive designs. Intermountain has nicely captured the major details and variations on the SD40-2 with performance and sound that is second to none. ©2014 Ryan C Kunkle, licensed to About.com, Inc. The best selling diesel of all time, the SD40-2 could be found on railroads all across North America. Athearn's SD45T-2 captures the massive proportions and small detail of this distinctive prototype. ©2015 Ryan C Kunkle, licensed to About.com, Inc. Adapted for life in the mountains, the SD40T-2 and SD45T-2 featured a revised radiator compartment which prevented overheating and stalls in the many tunnels along the Southern Pacific and Rio Grande mountain routes. Today these unique models can be found on railroads far removed from the mountain scenery. 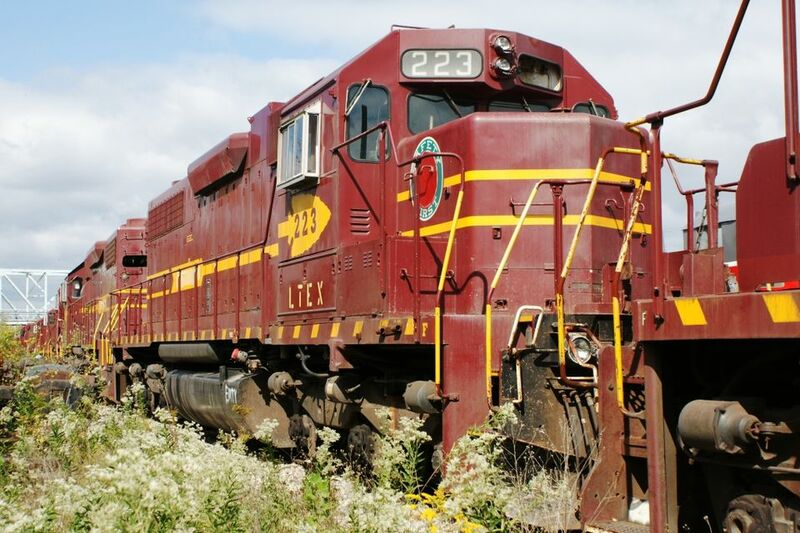 This Wisconsin Central SD45 has been preserved in operable condition at the Illinois Railway Museum. ©2015 Ryan C Kunkle, licensed to About.com, Inc. The 3600 hp SD45 was the darling of EMD's 1964 catalog but was eclipsed in sales and reputation by the SD40. With its distinctive flared radiator, the SD45 maintained a devoted following of railroaders and fans and many still roam the rails - though most have been rebuilt to SD40-2 specs. Athearn captured the finer details of the SD45-2 in their HO model including the large fuel tank on this former Erie Lackawanna unit. ©2015 Ryan C Kunkle, licensed to About.com, Inc.
Demand was strong enough for EMD to upgrade the SD45 to -2 standards in 1972. Although production was small compared to the SD40-2, the SD45-2 proved to have eliminated most of the problems associated with the earlier SD45 and a handful still roam the rails in the modern era. Conrail 6707 wears a special paint scheme honoring the servicemen and women of the Persian Gulf War in 1990. The locomotive was one of four units specially painted by American railroads in support of the troops. ®2010 Ryan C Kunkle, licensed to About.com, Inc. The SD50 would be the final locomotive to use the same 645 engine block introduced more than two decades before. The locomotive would be plagued with problems and some consider it the first step in EMD's slip in the build race with GE. This EMD leasing locomotive was one of three first delivered to Burlington Norhtern. HO scale model by Proto 2000 (Life-Like). ©2011 Ryan C Kunkle, licensed to About.com, Inc. Despite looking nearly identical to the SD50, with the introduction of the new 710 engine, the SD60 was a new locomotive inside. Fireworks burst in the air over Burlington Northern's patriotic SD60M No. 1991 in support of America's birthday, freedom and those who defend it. ©2011 Ryan C Kunkle, licensed to About.com, Inc.
With the addition of new crew comforts and cab controls, the SD60M marked the beginning of the modern era in locomotive design from EMD. The Athearn Genesis SD60I represents the last of the 60 series engines. No. 5544 was the prototype for the new isolated cab. ©2011 Ryan C Kunkle, licensed to About.com, Inc. Although only operated by one railroad initially, the SD60I, or isolated cab model, would pave the way for future quiet cab designs. One of three SD60Es wearing a special paint scheme, 6920 serves a dual role of motive power and public relations representative. ©2015 Ryan C Kunkle, licensed to About.com, Inc. Proving that good locomotives never die, Norfolk Southern has rebuilt many SD60 models into more efficient SD60E locomotives. Three special paint schemes have helped make these unique locomotives popular. In the mid 1990s the SD60 gave way to the SD70 series. With updated microprocessor controls, the SD70 was EMD's answer to the GE Dash 9 locomotives. Engines were available in standard, safety cab and AC traction motor versions. While normally assigned to drag freights, this Union Pacific SD70ACe is working as a helper locomotive on the rear of an intermodal train climbing the Tehachapi Mountains in California. ©2014 Ryan C Kunkle, licensed to About.com, Inc. The SD70ACe is the AC traction equivalent to the SD70M-2. Nearly ten years after the merger, a former Conrail SD80MAC still retains most of its original paint as it waits in the rain for its next coal train assignment at South Fork, Pennsylvania. ©2015 Ryan C Kunkle, licensed to About.com, Inc. The SD80MAC offered a 5000 hp locomotive with a proven engine and modern electronics. It was a more reliable alternative to the 6000 hp SD90MAC. Although only Conrail purchased the locomotives, years later their longevity over the SD90 models has proven the advantages of a safer path taken. Union Pacific 8194, and SD9043MAC is on the rear of a coal train racing along the busy Nebraska mainline east of North Platte. It is common for UP to use "distributed power" locomotives on the ends of coal trains here. ©2015 Ryan C Kunkle, licensed to About.com, Inc. When EMD promised a 6000 horsepower locomotive, several railroads expressed and interest. Few were ultimately convinced however and the trouble-prone locomotives suffered a rough reputation. Subsequent models lessened the power and promoted reliability more heavily.